Fettercairn is regarded as one of the most picturesque villages in the area, the parish lying at the south west extremity of Aberdeenshire. Lying on the historic route from Deeside south over the Cairn o’Mount, its old market cross confirms its long history. 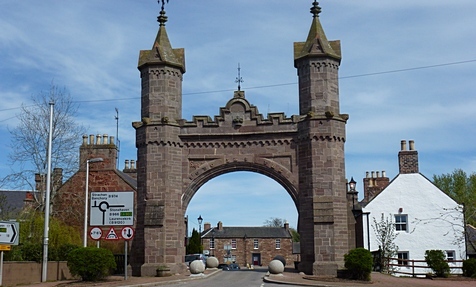 An elaborate commemorative arch marking the visit of Queen Victoria and Prince Albert in 1861 straddles the bridge of the burn, just next to The Ramsay Arms Hotel where the couple stayed overnight. The village also boasts its own distillery which dates back to 1824, and has a visitor centre welcoming tourists to the village. The parish church with its elegant spire dominates the scene and lies next to a former temperance hotel. The main event in the community is the annual Agricultural Show which was first held in 1826 and takes place on the first Saturday of July. At the north of the parish lies the site of Kincardine Castle – which gave its name to the county of Kincardineshire, and to the south Balbegno Castle, a beautiful example of an early 16th century laird’s home with its neat Georgian wing. Fasque House, the former home of the Gladstone family and now a stylish wedding venue with its own chapel, is only a mile from Fettercairn. Visitors can enjoy the local food at the Ramsay Arms Hotel or the Clatterin’ Brig Restaurant at the foot of the Cairn o’ Mount.